The River Cities' Reader is shifting to publishing bi-weekly. Our next print edition will be distributed on Wednesday, January 21, and a new Reader will hit the streets every two weeks after that. It's critical to understand that bi-weekly publication of the physical Reader does not mean that we're eliminating content. All of the features you expect will be available weekly online: an in-depth "cover story," Mike Schulz's movie and theatre reviews, feature articles on musicians and other artists, previews of upcoming events, Joe Collins' City Shorts column, John M. James' Music News column, Amy Alkon's Ask the Advice Goddess, Rob Brezsny's Free Will Astrology, Max Cannon's Red Meat, and a crossword. Those last four features will be debuting online this week. In many cases, you'll be getting the content earlier than you would in the weekly Reader. 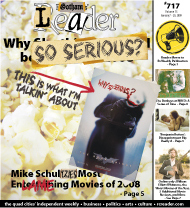 We'll be publishing new content each day of the work week at RCReader.com, and you won't have to wait until Wednesday to learn what Mike thought about the latest movies and theatrical productions, or what's happening in Illinois politics, for instance. Our comprehensive events calendar will still be available online, and we will be delivering it through a new tool in the coming weeks that will make it simpler to use and more useful. It will have powerful search and notification functions that it will make it easier to plan your life. Once that is in place, we'll likely phase the calendar out of our print edition to make room for other content. We'll still highlight noteworthy events in our print edition, and our printed seasonal guides will still offer the exhaustive three-month calendars we're known for. Other targets for improvement include our online Dining Guide and the ability to easily find related Reader content through tag-driven searches and an improved search tool. We're also developing new features, such as a Monday-through-Friday local-news digest that will keep you up-to-date on what's happening in the Quad Cities, providing links to and commentary on what's being reported in other media outlets. So why are we doing this? Obviously, printing and distributing a newspaper is an expensive proposition, one with increasingly diminished returns. Beyond the hard costs of producing a physical newspaper, though, there's the opportunity cost of a weekly publication. Bluntly, like most media companies, we've held fast to print at the expense of our online product, and that's not a sustainable business model. We've remained focused on printing a newspaper every Wednesday, even as the habits and preferences of media consumers have changed. Now, our model needs to adapt to this demand. Print is far from a dead medium, but to borrow from the legendary Ian Faith, its appeal is becoming more selective. Many of us still enjoy holding a physical newspaper or magazine, and reading a 2,000-word article can be a pleasure with paper and ink but is (and will probably always be) a chore on a computer monitor. And print is still an effective tool for us and our clients to reach our audiences. But print can be an inefficient way to distribute certain types of information, ideas, and commentary, and it has self-evident limitations: The search function is your eyes and your memory, and the accuracy stinks for most of us. The Web is not only a superior delivery system for some content, but it allows easy access to context (previous articles and background papers, for example) and primary materials (audio, video, and documents), and it's also a platform for instant feedback. Our aim is to better use the newspaper for content that benefits from being in print for two weeks, and to better use the Web for content that benefits from being searchable and linked to other content. This transition gives us the opportunity to improve our online and print products. What we're not going to do is change our identity. The River Cities' Reader remains your best Quad Cities source for thoughtful, incisive, and insightful reporting and commentary on the arts, culture, business, and politics. We've always excelled at providing perspective on our community and what's happening in it, and a new publishing schedule won't change that.